At the end of a typical day, bakeries have so much extra bread that even food banks can’t use all of it. Here’s another way to keep it out of landfills: make it into beer. 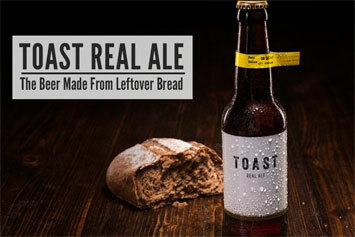 Toast Ale–a pale ale made with roughly one slice of surplus bread per bottle–first launched in London in 2016. The beer saves loaves (in its first 15 months, the project recycled 3.6 tons of bread) and raises money for Feedback, a nonprofit that fights food waste. The organisation is now brewing another version of the beer in New York City. “I was obsessed with bread, specifically, because it’s the one thing that even soup kitchens and food pantries have to turn away,” says Madi Holtzman, a graduate student at NYU studying the food system who met Feedback’s founder, Tristam Stuart, at one of Feedback’s food waste events in New York. After they talked about bread–Holtzman was working on a bread waste pudding at the time–she eventually ended up working with the organisation to bring the beer to the US. The beer was inspired by an ancient Babylonian recipe that uses bread as an ingredient, which Stuart discovered while visiting a Belgian brewery. It’s a process that is also sometimes used by home brewers. In New York, the biggest challenge was finding a microbrewery that could work on the project. Because of high rent, most craft breweries in the city are so small that they can’t take on additional production. Chelsea Craft Brewing Company eventually agreed to work on the beer and brewed a pilot batch in March. The process is a little different than usual. The resulting beer is an American pale ale, a little more malty and hoppy than the UK version of Toast Ale, with a little more alcohol. The bread replaces about 30% of the malted barley that would typically be used in brewing. Because it’s part of the base malt that creates alcohol, the bread itself doesn’t really impact flavour; that comes from the hops…..